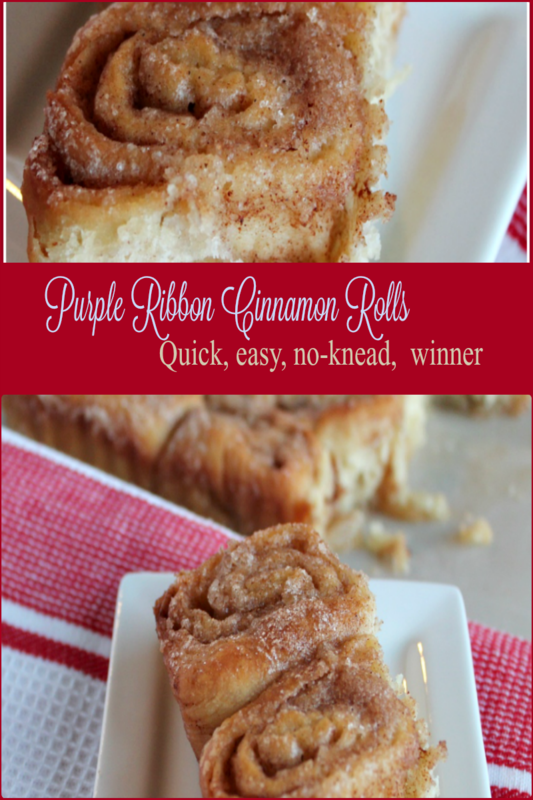 Buttery, sugar crisp and totally delicious, Purple Ribbon No-Knead Cinnamon Rolls are not your grandma’s doughy cinnamon rolls. No frosting needed, either. These Cinnamon Rolls are quick and so easy to make you can have them in the oven in just over two hours or you can make the dough the day before and let it rest overnight in the fridge. No kneading required! 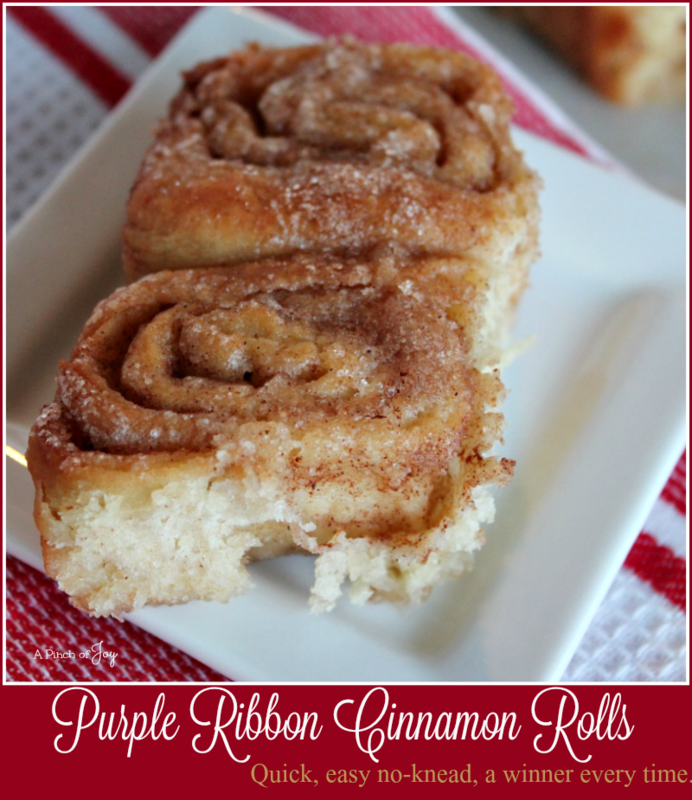 I’ve been making these rolls since I was in high school and they’ve brought home purple ribbons (the best) every. single. time. They are that good!! They are a part of every holiday breakfast — a tradition! The recipe itself is very simple. Mix the yeast with warm water from the tap. When you run the water across your wrist it should not be hot, neither should it feel cold. Lukewarm is what you are going for because too hot and the water will kill the yeast, too cold and the water will not activate the yeast. Don’t let that intimidate you, just know it’s an important step. Scalding the milk is another intimidating sounding procedure. It just means bringing the milk to an almost boil – little bubbles begin to form around the edge of the saucepan. Remove the pan from the heat immediately and pour the milk into your mixing bowl. Add shortening, salt, sugar and stir to melt the shortening. Yes, you can mix the milk, sugar, salt and shortening and microwave for about 1 minute. I like to think the flavor is better by actually scalding – but no scientific proof of that. This step allows the ingredients to blend thoroughly and to give the yeast a chance to do its job when it is added. It takes about the same amount of time for the scalded milk to cool to a just warm temperature and the yeast to soften. Measure out the flour and mix the cinnamon and sugar together while you are waiting. Add 1 cup of flour to milk and beat well with wooden spoon. This helps even the temperature – but don’t let that intimidate you. It’s just good to know so you don’t add yeast while the temperature is too warm. It should feel just warm—not hot. Add egg and yeast and mix well again. Dough will be sticky but should form into a blob – not quite a ball. At this point you can choose to cover with plastic wrap and refrigerate for several hours or overnight before making into rolls. Or if you are fast tracking it – flour a work surface well, turn the dough onto the work surface and flip it over two or three times to cover it lightly with flour. Let rest for 15-20 minutes before rolling out dough. This is the secret and what makes the cinnamon rolls unique. Don’t let this scare you – as you go along, you will know exactly what you need to do! When you roll the dough out on the floured surface, roll a long, narrow rectangle and make the dough fairly thin – no more than ¼ inch thick, preferably less. Just thick enough to hold the butter and cinnamon sugar mix. Melt the butter in the microwave and pour evenly over the rolled out dough. If you don’t have enough to cover – for goodness sake – literally!!! – melt another quarter cup and add it to the top of the dough. Same for the cinnamon sugar – it should absorb the butter as you sprinkle it evenly across the dough and melted butter. If it doesn’t, make more. Stop adding cinnamon sugar when the butter no longer absorbs it. A swipe with a spatula will help even things out. Some things vary from one time to the next and this is one time to pay attention to what you see in front of you instead of the precise measurements. You should have a lovely layer of cinnamon brown, sugary butter – no place with just butter and no dry cinnamon sugar. Roll dough topped with butter and cinnamon sugar into a long log and slice with a sharp knife. OR take an 18 inch piece of dental floss and slip underneath where you want the cut. Pull the ends of the dental floss up and make a criss cross on top of the log. Pull ends tightly. The floss slices right through the dough in a clean cut. Place the rolls tightly together in a greased 9×13 pan. Depending on the length of the “log” you made you may not fill the pan entirely full – it should be at least three fourths full. Crowding the rolls makes them rise high and stay thin. Sprinkle the top with remaining cinnamon and sugar to make the rolls crusty. Let rise and bake. Serve warm – or cold. For best flavor, peel the layers off each roll and savor each bite fully. Divine. Add hot chocolate . . . . beyond bliss!! You’ll be glad you pinned for future reference! 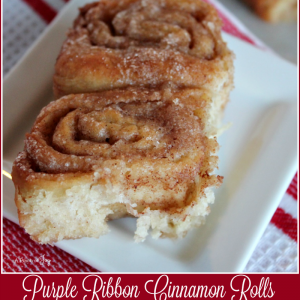 Not your grandma's cinnamon roll! Light, buttery, sugar crisp and a real winner every time! Quick and easy, no kneading required. Combine milk, shortening, sugar, and salt. Cool to lukewarm. Add 1 cup flour and beat well. Stir in yeast mixture and the egg. Add remaining flour and stir until dough is well mixed and sticky. If baking immediately, turn out on well floured surface and let set about 20 minutes. If baking several hours later or next day, cover bowl with plastic wrap. Store in refrigerator at least 2 hours. To make cinnamon rolls, flour surface well and dump dough from bowl into flour. Dust top of dough with more flour. Roll into long, narrow rectangle with the longest edge running parallel to front edge of work surface until dough is less than ¼ inch thick. Pour melted butter over dough and spread evenly. Mix cinnamon and sugar together and sprinkle evenly over the melted butter. Butter should absorb the cinnamon sugar. Starting at the far edge, begin to roll dough toward you creating a tight spiral the full length of the dough rectangle. When dough is rolled into a log, use a sharp knife to cut into rolls about 1 inch thick. Place tightly into 9x13 inch pan sprayed with cooking spray. Bake in preheated oven 350 for 25 minutes or until golden brown and rolls pull away from sides of pan slightly. Cool in pan on rack for about 10 minutes before serving. This sounds so delicious! Any idea how many tsp or so of yeast 1 packet is?? I tend to buy yeast in a jar since we make our own breads and I go through a lot of it. Pinned. What a great question! I edited the recipe to add the information. One package of yeast is equal to 2 1/4 teaspoons of jarred or bulk yeast. I love to bake bread — good for you for making your own! Can’t wait to make these. They look spectacular. We miss you here in Ohio. Hi Sue! Miss you guys too -loved the photos of the lunch bunch, btw! Wishing you and your family a very Happy Thanksgiving! !